Electronic Power Steering feels strange. New drivers may need a little time behind the wheel to grow accustomed to the feel. 182 hp 4-cylinder engine has a lot of weight to pull. Even more if you get the AWD version. Verdict: Dare we call it a station wagon? The Venza is much more than a station wagon or SUV. The all-new Venza is a five-passenger “vehicle” that combines attributes of a sport utility vehicle with the convenience of a passenger car. 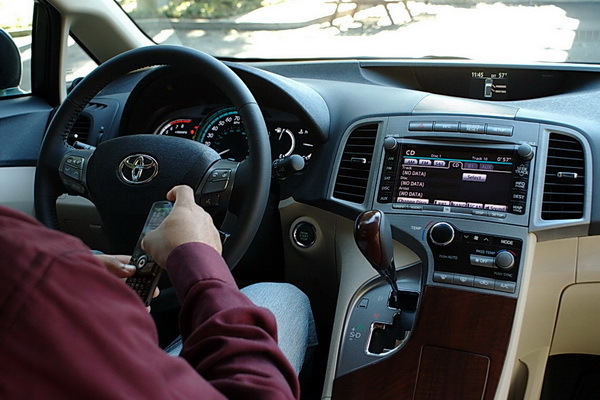 Think of the Venza as 30% SUV and 70% passenger car. Families looking for a vehicle with more cargo space than a 4-door sedan, but are seeking something more economical and responsible than a large SUV, like Goldilocks, may find the Venza as the right size vehicle for their needs. The 2009 Toyota Venza can be grouped together with all other family/cargo haulers in the niche. Among them are the Audi Q5, next generation Cadillac SRX, the Ford Edge and Flex, Nissan Murano, and Mazda CX-7 are but just a few of the competitors. While this new crossover from Toyota features some of the attributes of an SUV, such as abundant cargo space and a commanding view of the road, the Venza offers car like qualities when driving around town. We found the Venza considerably nimble considering its weight of 3,760 lbs. with the 4-cylinder, and 3,870 lbs. for the V6. Add another 185 pounds for the all-wheel-drive system. After spending a couple of hours riding around in the Venza, we came to the conclusion that the suspension was on the firm side. Nothing anywhere stiff like a truck or Ford Explorer, but firm enough to feel a lot of the bumps and divots in the pavement. Keep in mind that our test vehicles were prototype models, so it is possible the ride might soften up a little when the actual production cars reach the dealerships. One of the design goals of the Venza was to provide the driver with a high sight line, similar to being in a truck or SUV, but still allow easy ingress/egress just like a car with a low step-in height. Ladies with skirts, people who dislike clambering into a truck, and even people who are not very tall (like me) can appreciate this feature. The Venza has the same ground clearance as the Highlander, but the step-in height is closer to a Camry (close to five inches). The result: no stepping up onto a higher platform to get in/out and the driver still has a clear view of the traffic around her or him. Lowering the rocker panels has enabled easier ingress and egress. Ditto for the rear load-in height, which Toyota claims is lower than that of a Sienna. The hip point for seated occupants is higher than the typical sedan’s. The combination should deliver a mix many buyers seek: easy ingress and egress, with a higher seating position for a better view around tall vehicles on the road. The interior is laid out in what Toyota is calling a 60/60 design, which gives either the driver or front seat passenger the impression that they are able to access 60 percent of the dashboard controls from where they sit. 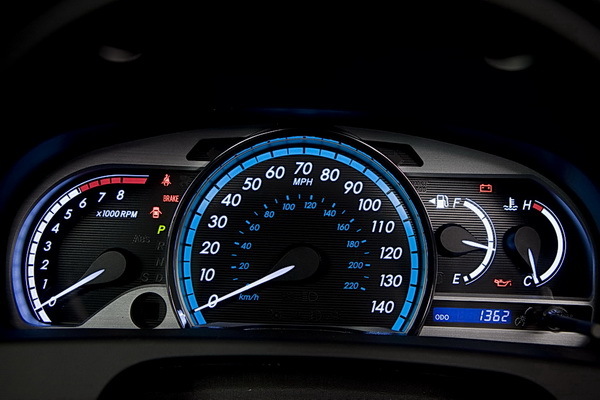 On the driver’s side, a large blue-illuminated speedometer dominates the center of the gauge binnacle, while the other gauges flow outward. A large center stack houses the navigation screen, audio system and climate controls and was covered in a nicely done satin mahogany finished wood grain or carbon fiber-style panel that helps to bisect the front seating area. The Venza’s dashboard splits the front portion of the cabin into two figurative halves. A prominent center stack holds most of the buttons and controls, including the dash-mounted gear selector, and drops down into a long, wide console. The largest console compartment looks big enough to hold a laptop, and it’s fitted with an auxiliary audio jack, intelligent cable routing, and at least one 12-volt power point. 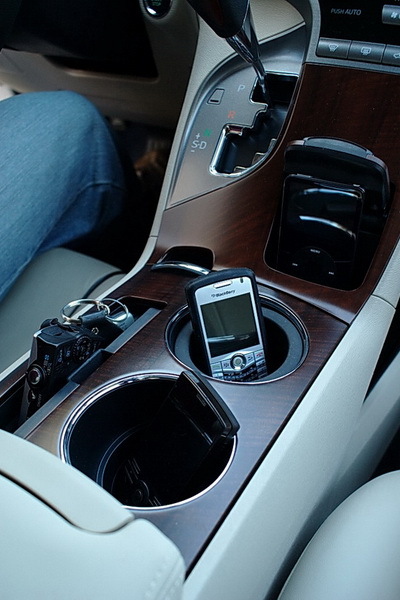 One of the many cool design features of the Venza is its ability to keep our progressively, technology, savvy society connected to his or her favorite electronic gizmo. It took a few minutes to figure out how to pair our phones, without any help from the intimidating manual, to the Bluetooth® wireless. Streaming music from our smart phone was a snap and easy to setup. 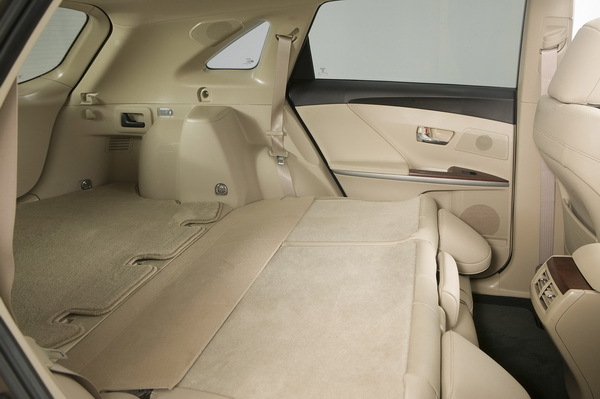 A 60/40-split rear seat offers the ability to make the Venza into a serious cargo hauler. Cargo capacity is a generous 30.7 cubic feet with seats up and 70.1 cubic feet when they are down. If you are loading the rear cargo area, there are two convenient door latch-style handles, that quickly cause the rear seats to drop forward and fold (almost) flat for added cargo space. A power lift gate with jam protection is optional for those who like to push buttons. 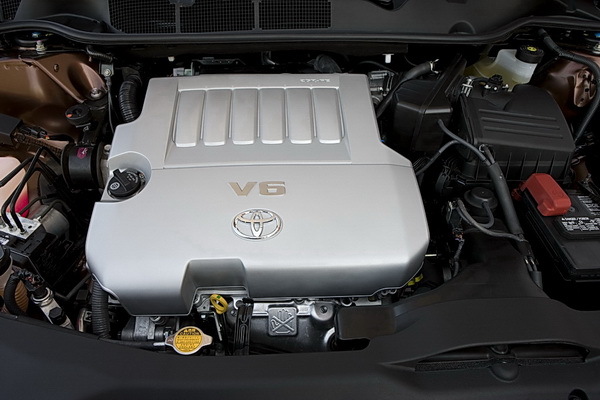 Two powerplants are offered with Venza. 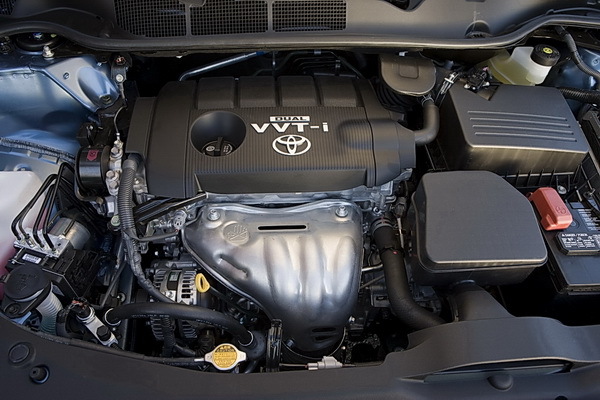 The economical option is Toyota’s new inline 2.7-liter DOHC 4-cylinder engine that pumps out 182 horsepower and 182 lb-ft. of torque. If you need more, there is the 3.5-liter V6 with 268 ponies and 246 lb-ft. under the hood. Both are mated to six-speed automatic transmissions and are available in either front or all-wheel-drive. EPA mileage estimates place the four-banger at 21 mpg in the city and 29 mpg highway for the front driver, and 20 mpg in the city and 28 highway, for the all-wheeler. The six-cylinder achieves 19/26 and 18/25, respectively. Since the 2.7L 4-cylinder is a new engine, Toyota announced that the smaller engine option will be available starting January 2009. 182 horsepower isn’t going to get you on the freeway lickity-split, but it does have a very even torque band. Once the power comes on after 3,000 RPM, it stays on and doesn’t feel peaky. The Venza moves with confidence along the road and can even inspire driver confidence in nasty conditions with the AWD version. We didn’t slog the crossover through a slalom course or banzai it up and down a tight, twisty road since the Venza is designed to be a more of a comfortable and safe people-mover. We did note that the Venza was a smooth and quiet performer on the road while driving like Mrs. Cunningham taking the boys to baseball practice. Our only unfavorable comment was the extra-firm ride quality. Not quite stiff enough to rattle any fillings loose, but we don’t recommend applying makeup or sipping a hot cup of coffee during the drive to work. 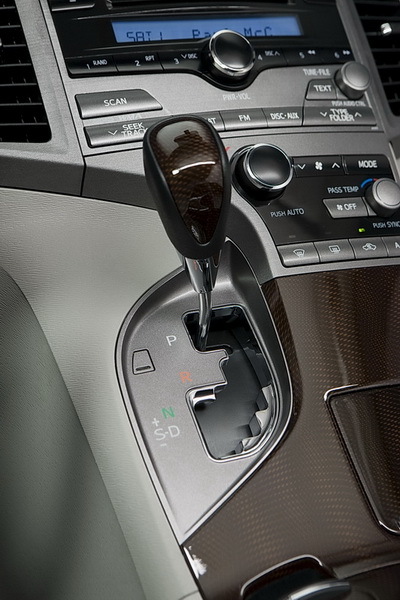 Toyota engineers opted to use Electronic Power Steering (EPS — rack-and-pinion with power assist) for steering control in the Venza. EPS is used in the Toyota Corolla that I recently tested and I still think the steering response feels strange whenever I use it. The power-assist is good in the parking lot and executing slow-speed maneuvers, but steering response still feels a little disconnected while driving at speed. The Venza and the Chrysler Pacifica are both very good cars. Most experts caution about reliability of new models, but I liked the Venza I drove, though make sure the electronic steering is acceptable to your tastes. If you don’t like it, try the Pacifica. By the way, the Pacifica is a well designed car with great reliability and quality of build. Chrysler scored a big win with it, as with some of their other models which have high quality. Toyota’s quality is questionable of late in several models, but I wouldn’t avoid trying out their cars nonetheless. Both Chrysler and Toyota have similar quality, with the edge to Chrysler in the past eight years. Exuse Me People are you not getting the point of Venza? The Venza is a great car, and don’t you dare compare it with a Chrysler Pacifica because it looks better, costs less, and is more reliable. A Chrysler Pacifica is a piece of crap on wheels. The Pacifica’s quality is terible and it is a piece of CRAP!!! The toyota is better. Also it has more technology then Chrysler or GM can ever imagine. And I Like The PAINT!! Why would you even buy a Chrysler now the GM is got in backrupt. Only Stupid people would buy the chrysler! C’mon…Toyota “invented” the Chrysler Pacifica 10 years after the fact and has the gall to think they’ve presented us something new. A Pacifica looks better, runs better and has the get up and go of a muscle car. This has a Toyota sticker…and apparently really bad paint. If you buy one of these the message you send is clearly that you can’t exist outside a herd mentality. @ultradad: are you kidding? Malibu Maxx looks NOTHING like the venza. The Maxx is plain ugly. Period. The Venza is just absolutely gorgeous and well thought out. It’s like night and day! Good job for Toyota! The ugly Malibu Maxx. Toyota took a photo of the Malibu Maxx and said hey, how can we make the front end, the interior, and the rear uglier. You got it. The Venza, the ugly Malibu Maxx.